While other mathematicians were beginning to specialize, Gauss’s interests spanned all of mathematics, both theoretical and applied, and his work is described as the transition from eighteenth century mathematics to that of the present day. Gauss, the son of a mason, was born on April 30, 1777, in Brunswick, Germany. At age 10 Gauss summed 100 terms in an arithmetic series moments after his instructor wrote the problem on the board. His instructor, realizing the boy’s abilities, brought him to a tutor, Johann Bartels, who befriended Gauss, and together they studied mathematics. Bartels introduced Gauss to Ferdinand, the Duke of Brunswick. Until his death in 1806 the Duke supported Gauss, making possible Gauss’s single ­minded pursuit of mathematics. At age 15, in 1792, Gauss entered Brunswick’s Caroline College. While there, he completed, but did not publish, theorems in the calculus that later would be independently constructed by AUGUSTIN­-LOUIS CAUCHY and Karl Weierstrass. He also discovered non­Euclidean geometry; but buried his ideas for decades in a private notebook. Gauss entered the University of Göttingen in 1795 and concentrated on mathematics. He discovered that a regular 17­sided polygon could be constructed using only a straight edge and compass, and devised formulas for constructing such polygons. He was the first mathematician to further EUCLID’s work on this problem. Gauss’s doctoral thesis, completed through the University of Helmstadt in 1799, contained a proof of the fundamental theorem of algebra (he published others later), which said that any equation containing complex coefficients must have a complex solution. His first major book, Disquisitiones Arithmeticae (1801), is one of the most important in all of mathematics: it discusses concepts in number theory, including the properties of integers and complex numbers. Complex numbers contain both real and imaginary numbers, real numbers being values that can be expressed as a terminating or non ­terminating decimal, and imaginary numbers being values that are the square roots of negative numbers. Gauss’s work on number theory was extensive. He tried to expand the real number system. He argued for including imaginary and negative quantities, and he showed how they could be plotted on a graph with x and y coordinates. When real and imaginary numbers converge to determine a point, Gauss combined them as separate complex numbers. All other numbers can be derived from Gauss’s complex numbers. In 1807 Gauss became director of the Göttingen Observatory, where he remained for life. He became involved with problems in astronomy and geodesy, the study of the size and curvature of Earth’s surface. He determined the orbit of the asteroid Ceres, explaining his methods in Theory of Motion of Heavenly Bodies, (1809). His interests in map making and shone paths led to work in differential geometry, including publication of General Investigations of Curved Surfaces (1827). In 1833 he invented an electric telegraph, using it to communicate with collaborating scientist Wilhelm Weber. Gauss died at age 78 on February 23, 1855, in Göttingen, Germany. The scope and usefulness of mathematics became fully realized in the nineteenth century, and Gauss led the way: He closed gaps in each of its traditional branches: geometry, algebra, the calculus, and number theory. One of Gauss’s most important contributions was his interpretation of complex numbers: it made the number system sufficient to solve any algebraic equation. Completion of the number system parallels the development of the periodic table in chemistry, it was a landmark achievement that alone would have made Gauss famous and the work of future mathematicians easier. 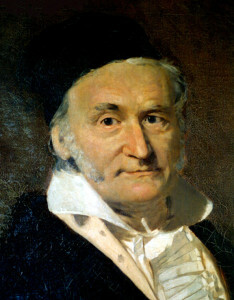 Gauss challenged two succeeding generations of mathematicians. He personally selected the doctoral topic for Bernhard Riemann, who proposed a non­Euclidean geometry of curved space that Einstein later claimed as a physical reality. Other Gaussian heirs were Augustin Cauchy, Karl Weierstrass, and his student Georg Cantor. These mathematicians helped systematize contemporary mathematics.